Often you have to work a lot in notepad for scratch reason, and every time for creating a new scratch or a document you need to open a new notepad and then you have to type there. Now, won’t it be great that you should have such a notepad in which multiple tab option should be present. Just like Mozilla Firefox. Yes, surely it will be quite beneficial and will also save your time a lot. It will be same as notepad and it will save the file also in .txt format but the change is just ease of access, like multiple tabs, better looks and much more. Different from classic notepad, 'Notepad Tabs' gives the freedom to view multiple text files in a single Notepad just like in IE7 and Firefox, which saves you from the mess in the taskbar. 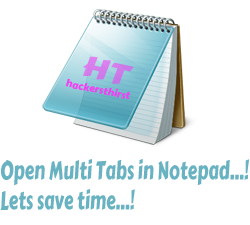 You can easily select and navigate through open tabs in a single Notepad program. 1) To make it default text reader and notepad then “right click” any text file and select “open with” go to “choose default programs” and in that choose “Notepad Tabs” by browsing and going to the Notepad Tabs directory under the Program Files and select NotepadTabs.exe. Tick the option that always use it as default program or always use this to open this type of files or something like this. 2) For opening new tabs in Notepad Tabs press “ctrl+t” and for closing current tab press “ctrl+w”. You can download Notepad Tabs here.